Cool mornings, balmy evenings and the fragrance of parijaatham in the air – This last month was a festive time in namma Chennai. 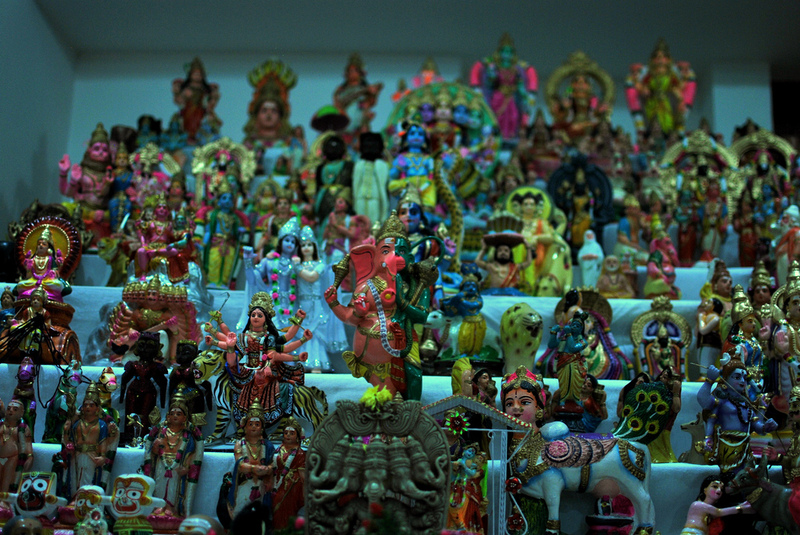 The dolls were out, golu padis (steps)were fixed up, silk sarees were aired out and recipe books consulted for sundal. The city wore an air of expectancy and there was a feel of unrestrained joy- such is the spirit of Navaratri. But have you ever asked yourself, why a golu? Why all this for this particular festival? Well, every family seems to have their own reasons for keeping a golu. Many say it is to celebrate the fight of the Goddess Durga against the demon Mahishasura. But again, the question arises, why keep a golu? Apparently, this fight was very important because Mahishasura was a great warrior and there was a feeling that Goddess Durga may have met her match. So the Gods united to give the goddess their most potent weapons and she is said to have carried them with her to battle. All of them came down to Earth to witness this great battle. This is symbolically represented by the people of Tamil Nadu by keeping a golu wherein all Gods are present. Again, this agrees with the way a golu is organised, with the gods on the on the topmost padi (step), followed by the ten avatars of Vishnu, the spiritual heads, then the temporal heads and finally common people. Have you paid attention to the wooden, distinctly ugly Marapacchi dolls in a corner? Earlier made of Red Sanders, these wooden dolls come from Tirupati, and always in a pair. It was a gift given by a girl’s father to their daughter, who, at the time of marriage would have been a child herself. Perhaps in those days, when there were no cameras to click the occasion, a doll dressed in all finery would have been a good memory of the most important day in the bride’s life. Further, the wood was said to have medical properties, and was ground into a paste and used. Today, it stands as a keepsake and many households take pride in the Marapacchi as an heirloom. And what about Sundal? Why should this simple delicacy be so closely associated with this period of the year? Most customs stem from a simple story and grow over the years into some pretty heavy stuff. One theory postulates that sundal was offered to appease the Navagrahas ( celestial star spirits), who are associated with nine varieties of grains. These grains were used in preparing the offering, and one could prepare any dish using the grains –vadas, kheer, puttu, chikki, murukku… However, ten days is a long time to sustain exotic food and so the humble sundal came to stay. Easy to make, easy on the pocket, fairly light on the stomach and easy to pack as a giveaway – all of these could have contributed to ensure that the humble sundal came to stay. The Ayudha Pooja, now means sandal paste in new designs adorning all appliances and cars, autos and trucks “dressed” in their best and making the rounds of the city, horns blaring. It’s a moot point if it had started this way. One legend says that it was the time when the Pandavas retrieved their weapons, so long hidden on a treetop, and worshipped them before moving on. Another says that Goddess Durga prayed to the weapons she had gotten from the Gods after she had killed the demon, and so the practice began. Navratri is celebrated very differently across India and for different reasons too. For a Tamilian, more than anything else, it symbolizes the victory of good over evil or new beginnings on Saraswati Pooja day, including education and fine arts. In the north India, Dussehra is a festival celebrating the victory of Lord Rama over Ravana. Ravana is the villain of this version and paid the price for abducting Rama’s wife. Elsewhere, in places like the Bastar district, it is Ravana who is the hero. He is, they claim, every bit as learned, versatile and capable as Rama. Moreover, he was a great devotee of Shiva and was loved by the people he ruled. So in Bastar, they celebrate Ravana. 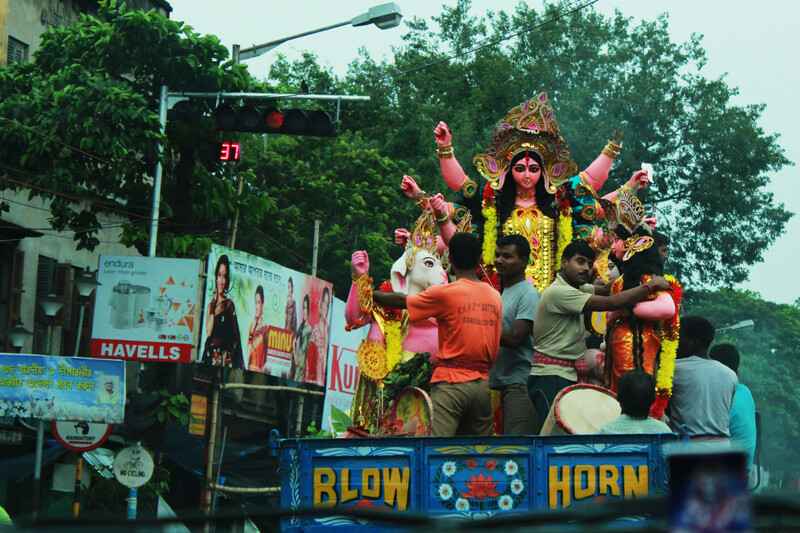 In Bengal, during Dussehra, people celebrate the Goddess killing Mahishasura. Many also look upon her as the daughter who has returned to her father’s house for some rest and relaxation. When she leaves to go back to her husband, Shiva’s home, the whole city turns out to bid farewell and after her departure, there is a palpable air of sorrow and loss over the place. Most of these stories do converge, but the emphasis on particular stories varies across the country. Different styles, different reasons, whatever, let’s celebrate the differences and celebrate the festival. Viva Navaratri!